Definition at line 35 of file CQCompartmentDM.h. Definition at line 26 of file CQCompartmentDM.cpp. References CModelEntity::ASSIGNMENT, CModelEntity::FIXED, FROM_UTF8, mItemToType, mTypes, CModelEntity::ODE, and CModelEntity::StatusName. Definition at line 53 of file CQCompartmentDM.cpp. Definition at line 76 of file CQCompartmentDM.cpp. References COL_EXPRESSION_COMPARTMENTS, COL_IEXPRESSION_COMPARTMENTS, COL_IVOLUME, COL_NAME_COMPARTMENTS, COL_RATE_COMPARTMENTS, COL_ROW_NUMBER, COL_TYPE_COMPARTMENTS, COL_VOLUME, flags(), FROM_UTF8, CCopasiRootContainer::getDatamodelList(), CExpression::getDisplayString(), CModelEntity::getExpressionPtr(), CModelEntity::getInitialExpressionPtr(), CModelEntity::getInitialValue(), CCopasiObject::getObjectName(), CModelEntity::getRate(), CModelEntity::getStatus(), CModelEntity::getValue(), CQBaseDataModel::isDefaultRow(), mItemToType, rowCount(), and CModelEntity::StatusName. Referenced by flags(), and setData(). Definition at line 58 of file CQCompartmentDM.cpp. 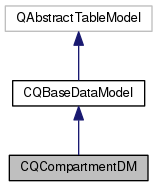 References CModelEntity::ASSIGNMENT, COL_IVOLUME, COL_NAME_COMPARTMENTS, COL_TYPE_COMPARTMENTS, data(), FROM_UTF8, and CModelEntity::StatusName. Definition at line 44 of file CQCompartmentDM.cpp. Definition at line 39 of file CQCompartmentDM.cpp. Definition at line 164 of file CQCompartmentDM.cpp. References COL_EXPRESSION_COMPARTMENTS, COL_IEXPRESSION_COMPARTMENTS, COL_IVOLUME, COL_NAME_COMPARTMENTS, COL_RATE_COMPARTMENTS, COL_ROW_NUMBER, COL_TYPE_COMPARTMENTS, COL_VOLUME, FROM_UTF8, CCopasiRootContainer::getDatamodelList(), CModel::getVolumeRateUnitsDisplayString(), and CModel::getVolumeUnitsDisplayString(). Definition at line 277 of file CQCompartmentDM.cpp. References ListViews::ADD, COL_NAME_COMPARTMENTS, ListViews::COMPARTMENT, CQBaseDataModel::createNewName(), CCopasiRootContainer::getDatamodelList(), CModelEntity::getKey(), CQBaseDataModel::notifyGUI(), and TO_UTF8. Definition at line 327 of file CQCompartmentDM.cpp. References C_INVALID_INDEX, CQMessageBox::confirmDelete(), FROM_UTF8, CModel::getCompartments(), CCopasiRootContainer::getDatamodelList(), CCompartment::getDeletedObjects(), CCopasiDataModel::getModel(), CCopasiObject::getObjectName(), CQBaseDataModel::isDefaultRow(), and CQBaseDataModel::removeRow(). 341 //before actually deleting any item. Definition at line 292 of file CQCompartmentDM.cpp. 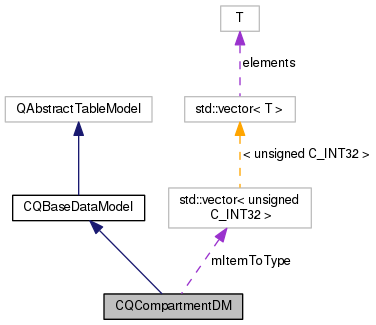 References CCopasiVector< T >::begin(), ListViews::COMPARTMENT, ListViews::DELETE, CModel::getCompartments(), CCopasiRootContainer::getDatamodelList(), ListViews::METABOLITE, and CQBaseDataModel::notifyGUI(). 319 emit notifyGUI(ListViews::METABOLITE, ListViews::DELETE, ""); //Refresh all as there may be dependencies. Definition at line 49 of file CQCompartmentDM.cpp. Referenced by data(), and CQCompartmentsWidget::deleteSelectedCompartments(). Definition at line 235 of file CQCompartmentDM.cpp. References ListViews::CHANGE, COL_IVOLUME, COL_NAME_COMPARTMENTS, COL_TYPE_COMPARTMENTS, ListViews::COMPARTMENT, CQBaseDataModel::createNewName(), data(), FROM_UTF8, CCopasiRootContainer::getDatamodelList(), CModelEntity::getKey(), CQBaseDataModel::insertRow(), CQBaseDataModel::isDefaultRow(), mItemToType, CQBaseDataModel::notifyGUI(), CModelEntity::setInitialValue(), CCopasiObject::setObjectName(), CModelEntity::setStatus(), CModelEntity::StatusName, and TO_UTF8. Definition at line 58 of file CQCompartmentDM.h. Referenced by CQCompartmentDM(), data(), getItemToType(), and setData(). Definition at line 54 of file CQCompartmentDM.h. Referenced by CQCompartmentDM(), and getTypes().